Laforge overhead doors are positioned as our premium overhead door solution for garage door renovations or industrial door face changes. When replacing an Edmonton commercial overhead door, no finer choice can be made. Laforge doors are engineered with a 1,3/4" core of polyurethane foam insulation that provides an R16 value throughout each panel. The core is permanently bonded to the twin outer face sheets with a unique high pressure, heat bonding process. 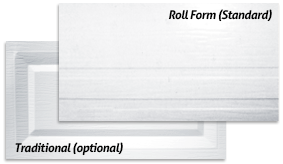 Customize your panel with either Traditional or Roll Form, or if you prefer, you may also have Flush panels, no embossments are imprinted, just the realistic wood grain look. Did you know that per square foot, adding a garage door window (thermopane) to a garage door is less expensive than adding a window to your garage wall? We offer a variety of over head door windows. While only 3 versions are shown here, the options are virtually endless. Just like our garage doors, our window selection can be custom made to your specifications. Our pre-finished PVC extruded frames, which are available in different colours, are designed for easy removal and reinstallation should the need arise to replace a broken pane. Held in secure with 14 zinc coated screw, our windows boast a 2 point seal system on BOTH the thermo and the door panel. These commerical over head door windows are built to last. Our Laforge steel skins have a 26 gauge rating. We have 4 enduring colours to choose from. Like our aluminum counterpart, each door is injected with polyurethane through a special heat bonding process to give the doors an R16 rating. Laforge doors are engineered with a 1,3/4" core of polyurethane insulation that provides up to a R16 value throughout each panel. The core is permanently bonded to the twin outer face sheets with a unique high pressure, heat bonding process. Laforge doors are designed and manufactured for the Nordic climates. Every door is installed complete with weather seals at all points of exposure. A 3 point seal system has been developed to create a continuous barrier at each panel section. High density injected Polyurethane (CFC Free) ensures panel strength and provides an energy saving R16 value. The rich wood grain texture of Laforge doors creates a finish that has the appearance and the feel of authentic wood. The sides of the Laforge doors are menufactured with wood blocks inserted into the inner skin to provide reinforcement for the hinges while providing added stability. Laforge doors all come standard with the EPDM bottom seal. EPDM seals allow for extra flexibility in all weather situations to proved a greater prevention of air, snow and dust infiltration. 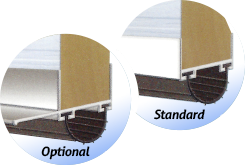 Choose, as an option between the standard PVC bottom rail, or an aluminum bottom rail. Laforge tracks are made of high quality 12 and 13 gauge galvanized steel. Shown below are 5 different lifts along with the torsion springs in place. Heavy duty tracks are available for 33T assemblies. Low headroom 5" rear mount - 12" front mount. Add 3" for T-bar electric operator. Low headroom 12" rear mount - 15" front mount. Add 3" for T-bar electric operator. Galvanized track 2" x 0.075"
Galvanized track 3" x 0.109"